A dedicated proponent of service and working with young people, first lady Michelle Obama is an example of how one woman can positively influence the world. On Sunday, May 15, at 3 p.m., at the Georgia International Convention Center, Mrs. Obama will inspire more than 500 graduates to also leave their mark on the world when she delivers the commencement address to the Spelman College class of 2011. Mrs. Obama will also receive an honorary degree. Honorary degrees will also be bestowed upon director, actress and choreographer Debbie Allen, and her sister, actress and director Phylicia Rashad. Wendy Kopp, CEO and founder of Teach For America will receive the National Community Service Award. "Having Mrs. Obama as our 2011 Commencement speaker is a true honor because she embodies the Spelman College mission which is to prepare women to change the world in a meaningful way," said Beverly Daniel Tatum, Ph.D., president, Spelman College. "I know our students will be inspired by her powerful presence." Did I mention that in time for my commencement, Morehouse attempted to have President Obama give the commencement address? It didn't happen and that OK, I hear there was a lot of logistical things to work out. I mean Obama is the leader of the Free World and there are security measures that need to be in place for him. 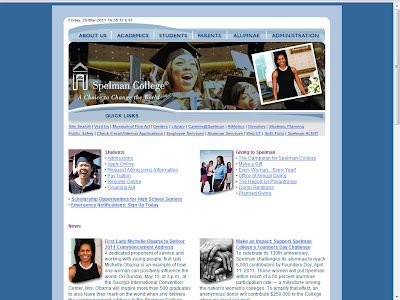 If you want to know how excited Spelman is about Michele Obama coming to speak to their graduates look no further than this screenshot! A likeness of our first lady is in the masthead of the Spelman College homepage.